If you are looking at bitcoin, you may be at risk of not seeing the full potential of blockchain. Bitcoin is somewhat of a distraction from the value blockchain may deliver to commerce globally; bitcoin creates a blind spot for executives seeking a view of the future. Every business depends on relationships. No surprise there, right? And common wisdom tells us that the foundation of all successful relationships is trust. So why do most businesses act as though no one can be trusted? Not suppliers, not partners, and not customers. Let's think about it. In commercial transactions, trust is rarely assumed as an automatic part of the equation. We create, operate and scale businesses in a trust vacuum, and we start by assuming that counterparties are likely to misrepresent, cheat or steal — or at least bend the attributes or status of asset inventory or transactions. So we insist on verifying every transaction with contracts, records and receipts. And we rely on intermediaries, who are now rampant in modern commerce, to negotiate and middle-manage many of our transactions. Take lawyers, for example. In 1900, there was one lawyer for every 667 people in the United States. By 1960, that ratio was 1:627, a relatively modest increase for a 60-year period that also included explosive growth in manufacturing, financial services and other economic sectors. Today, in 2016, there is one lawyer for every 247 people in the United States. For the past half century, the number of lawyers has grown much faster than the general population — driven in part by our increasing dependence on middlemen, contracts and intermediaries in all kinds of transactions. In the video below, I cover the impact blockchain could have on healthcare — with a concept I call "carechain." The time and expense these verification services and intermediaries require — and the friction and complexity they create in our business relationships — often seem insurmountable. Let's examine how difficult it has become to buy a home, a transaction that on the surface is relatively simple. Before the seller hands the buyer the keys, there are innumerable hand-offs and mini-transactions involving real-estate agents, mortgage brokers, inspectors, lenders, title insurance companies and lawyers — all rooted in the idea that buyers and sellers can’t trust each other and need third parties to protect their interests. 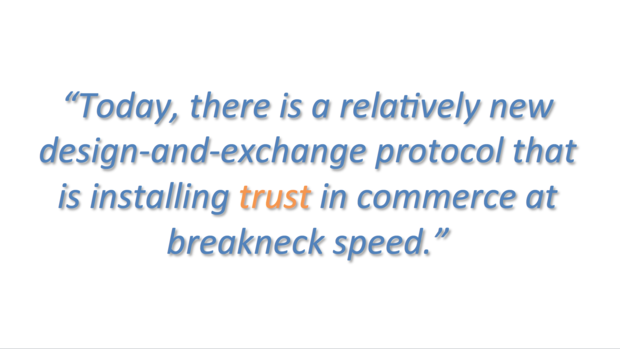 Today, there is a relatively new design-and-exchange protocol that is installing trust in commerce at breakneck speed. This design-and-exchange protocol is called “blockchain.” If you’re not familiar with blockchain, the concept was first explained in a paper published online in October 2008 by an entity made up of people using the name Satoshi Nakamoto. That paper described the bitcoin cryptocurrency built on a premise of many things, one of which is blocks of data chained together by unique techniques and then shared in a new type of ledger that is distributed by design. Bitcoin turned out to be the first application to conduct blockchaining. Bitcoin is just the first instance of the techniques that constitute the design-and-exchange protocol of blockchain. The result of this bitcoin application/instance, blocking and chaining data in a ledger that is distributed by design, led to a broader and wider discovery around the value and technique of blockchains — today blockchain represents the largest transformative paradigm we may experience in our lifetimes. Blockchain, a powerful and disruptive innovation that uses algorithms to enable the creation of ledgers of data that are secure and distributed by design, has the potential to transform the delivery of public and private services, increase productivity, and revolutionize the way we do business. Humans have been using ledgers for thousands of years to record the accumulation and exchange of assets such as money and property. As technology evolved, ledgers moved from clay tablets to paper to computers, but their basic format and function remained unchanged. Ledgers remained individually managed, and not shared by design. Blockchain offers something new, distributed ledgers. Distributed ledgers function as databases counting for inventory assets or statuses of transactions that can be shared across a network of multiple participants by design. All companies, organizations or governments in the network of participants have identical copies of the distributed ledger, and any change to one copy is verified by consensus and then automatically recorded in all. Distributed ledgers are transparent and collaborative, and cryptographic keys ensure their accuracy and security. The techniques of encryption, hashing and miners render blockchain distributed ledgers to be virtually unhackable. Many executives today can’t see the true potential of blockchain. When we look into the future, all we see is bitcoin. Blockchain remains hidden in our blind spot. But the blockchain technology is no secret. Unfortunately, however, most of these projects are pointing in the wrong direction, focusing on bitcoin or other cryptocurrencies. That is the mistake, because bitcoin is to blockchain what the first AOL chat rooms were to the internet. Bitcoin is merely an early blockchain application, one that barely scratches the surface and offers an extremely limited view of blockchain’s potential to disrupt across multiple vertical industries and drive horizontal innovation throughout the economy. Why is blockchain important to business? The past four decades have been one of the most remarkable periods of invention in human history. During that time, we have seen the rise of personal computers, the internet, smartphones, cloud computing, holographic imaging and 3D printing, just to name a few innovations. Blockchain promises to outshine them all in terms of sheer cross-vertical impact. In the diagram above, the internet (A) created the first digital consumption landscape in the network/security layers of commerce all the way up to consulting layers of commerce creating “online companies.” The cloud (B) reconfigured the competitive landscape in the storage layers of commerce all the way up to the marketing layer of commerce, unseating online companies with more efficient and effective “cloud companies.” Blockchain (C), promises to change commerce by starting with the way we organize and govern corporations at the bottom layer of commerce, and then reshape the consumption and competitive landscapes all the way up the stack ending at the top in the way we brand and market. Blockchain is a “total reset” of all layers of how commerce works today, representing massive potential of efficiency gains by redesigning all of the online and cloud companies. Are you thinking this all sounds like so much snake oil? Too good to be true? Keep in mind that many executives said the same thing about the internet 20 years ago. Look how that turned out. 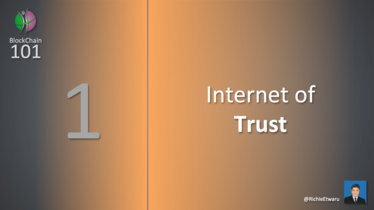 The internet of trust: TCP/IP, which is the current technology design-and-exchange protocol, makes the internet a network of information exchange. Blockchain is the new protocol for exchanging anything of value — not just currency or information — over the internet. 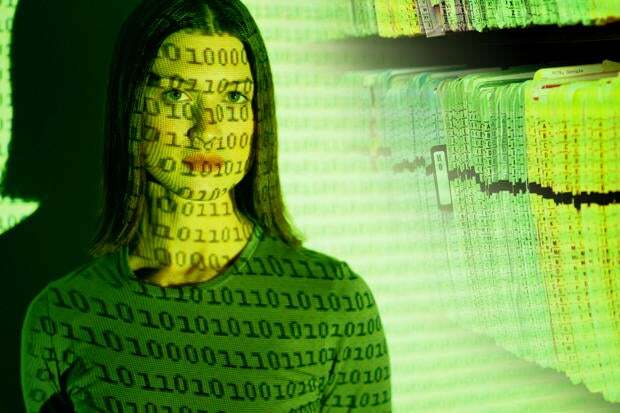 A blockchain is a type of database that pulls together various records into a block of virtually unhackable information that is verified and encrypted. Each block is then “chained” to other previously verified and encrypted blocks of information. For all participants in the same network, the whole process is completely transparent. The information in those blocks is seen by all and owned by none. Blockchain, as the protocol for exchanging value when trust is abundant, is creating the internet of trust. I am in the middle of using an online lease-trading site to get a rid of a car. I have a buyer willing to take over the lease, but it is taking four weeks to complete the transfer. The buyer paid $100 to file a credit application, it cost me $350 paid to my leasing company to transfer the lease, and we each paid the lease-trading site $350 to introduce us to each other. That’s a total of almost $1,200 and four weeks to transfer the lease from me to him. That’s a system built on the absence of trust. More to come on "AutoChain." 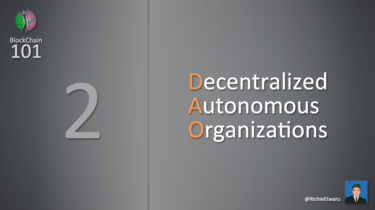 Decentralized autonomous organizations: Once trust is abundant between parties, truth emerges in transactions and asset inventory data, and consensus becomes easy. Consensus, the overall term for corroborating the accuracy and integrity of a ledger, is a direct byproduct of blockchaining. When consensus is cheap, easy and quick, organizations can operate in a more decentralized and autonomous way, no longer needing hierarchies and intermediaries to achieve consensus. During my career, I’ve been involved in several requests for proposal (RFP) for projects that aggregate to hundreds of millions of dollars. The ability to determine what projects responding suppliers have done in the past and what projects they can do successfully in the future gets lost in the sales journey that is locked into the RFP. Reaching consensus on choosing a supplier is often somewhat of an improper fraction. People who have power but little knowledge make decisions to override people who have knowledge but little power. And suppliers take advantage of this truth vacuum by wining and dining company executives essentially engineering consensus and bending truths. More to come on "SupplyChain." 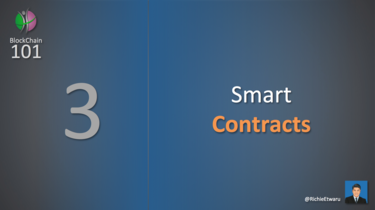 Smart contracts: When organizations are autonomous, and trust and consensus are at least available if not abundant, they can exchange value seamlessly in direct peer-to-peer (P2P) networks. Here P2P is really a heterogeneous mix of organizations (sometimes fierce competitors) and consumers creating B2B2C networks. The power to exchange value is no longer in the center of the network for verification systems, contracting agencies or intermediaries to arbitrate. The power to exchange value freely, transparently, and reliably moves to the edge of the network. Smart contracts enable digital agreements between unusual parties and can be executed automatically by a computing system. By lowering the costs of contracting, enforcement and compliance, they make it economically feasible to use contracts to authenticate and enforce even low-value transactions. I happen to own a restaurant as a hobby investment. I use OpenTable to manage the seats and availability, and I’m attempting to start to use an OpenTable competitor called SeatMe as well. There is no central system where I can easily store all of my restaurant’s seat availability so that both SeatMe and OpenTable can access and update that information in real time. As a result, I am forced to manage two systems and manually update my inventory of available seats on both systems. Smart contracts between two competitors such as OpenTable and SeatMe could eliminate this type of unnecessary friction for business owners and promote healthy competition among vendors. More on "TableChain" to come. The purpose of this blog post is not to provide answers, but to help spark the questions we should all be asking about the potential of blockchain technology and the benefits it can create for businesses, organizations and governments worldwide. The hope is that we start to look past bitcoin, which I believe may be a distraction to the true value here. It took about 12 years for the internet to progress from being what a lot of people considered snake oil to being a very real and transformative technology. Cloud computing got real in about half that time. Blockchain is evolving even faster and promises to profoundly change the way we live and work.